Life is never static. Just when you think you finally have everything under control, that illusion is shattered…and the life you once knew has spun off in unimaginable directions. 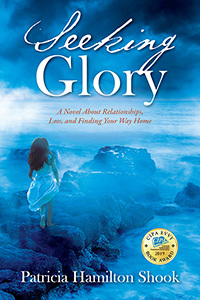 Seeking Glory is an eloquent novel that explores the complexities of family relationships. With themes of loss, recovery, estrangement, and reconciliation woven throughout, it tells the story of a woman who seeks to uncover the truth about her young granddaughter’s origins. Lying in the semidarkness, light filtering through the flimsy curtains that covered the sliding doors, Kate tried to focus on happier things. The Sea Witch filled with one of a kind gifts and works of art lit by the sun on a fragrant summer day. Admiring people walking through the store buying whatever took their fancy. Days spent as a buyer herself searching all over the Cape for just the right piece of art for her store. Or other long days spent lying on the beach or walking in the surf as she gathered seashells and pretty stones, and swimming in the gentle waves of Nantucket Sound. Kate could see herself younger, happier running on the beach with her sister Maggie long before marriages and children and careers had pulled them in different directions. Suddenly she was older walking along that same beach hand in hand with David at night, the moon lighting a path across the water. The two of them stopping to kiss by the water's edge, feeling again the warmth of his lips , the taste of his mouth, the pressure of his body against hers. And, of course, there was Ally, skipping along the beach a happy carefree little girl again, a pail and shovel in her hands. Kate called to her and she ran laughing down the beach. "Ally! Come back!" Kate called, running now herself. But Ally climbed out onto one of the jetties that stretched out into the Sound, clambering over the sharp rocks, heedless of the waves now crashing against them, sending sprays of water into the air. Kate screamed Ally's name, struggling in the surf, the world now dark with an impending storm. Kate could see Ally perched on the very last rock looking out toward the horizon. Kate continued to struggle toward her, pulling herself up on the rocks next to Ally. And as she did so, Ally turned to look at Kate, whispered "Glory," and then was gone. Vanished into the spray and the mist, leaving Kate alone and clinging to the last rock of the jetty as the storm broke around her. Patricia Hamilton Shook was born in Massachusetts, where she has lived most of her life. As a psychologist, she combines her professional expertise with an interest in spirituality and mysteries—along with a love of Cape Cod that dates back to childhood—to inform her debut novel, Seeking Glory.